The US Roundtable for Sustainable Beef has been around for a little over a year, working to advance, support and communicate the continuous effort being made by producers to improve US beef production practices. During its most recent meeting held in Denver this past July, Farm Director Ron Hays met up with the Roundtable’s Chairman, John Butler, who laid out the group’s mission and their plan to accomplish it. Keeping things in simple terms, Butler explains the importance of sustainability. Butler boils his definition of sustainability down so that it basically becomes an exercise of continual improvement in several different facets like animal welfare, water conservation, etc. He explains that the group is working to develop benchmarks and indicators to associate with production practices, so that later on, measurements can be made to show progress. This way, they will be able to ask the questions, ‘did we make a difference; if so, how did we do that; can we replicate it and become better?’ He notes though, that strategy has must be kept in mind. 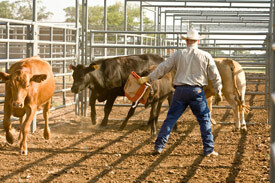 According to Butler, the group’s efforts will be conducted in many ways similar to that of the Beef Quality Assurance (BQA) program. He says once their benchmarks have been determined, there will be an educational initiative to teach producers how to incorporate sustainable practices into their programs, while offering tools and resources for ranchers to use. From there, indicators built in as part of that education, will later verify that the industry is sensitive to those indicators within a measurable scheme. In reality though, Butler says producers are currently doing a lot of things right. Listen to Butler describe the Roundtable’s efforts in increasing sustainability in the US beef industry to Farm Director Ron Hays on today’s Beef Buzz.